Vertu handsets have always been prohibitively expensive for, well, just about anyone. 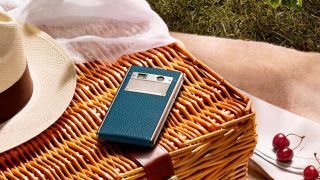 The Vertu Ti for example arrived for a price of £6,700 (around $10,600 / AU$10,300) upwards, but Vertu's latest phone, the Aster, is positively affordable in comparison, with a starting price of just £4,200 (around $6,900/AU$7,800). Yet despite the lower price tag it's actually set to be a far better phone than the Ti, as following on from Vertu's recent commitment to high end tech the Aster has a 2.3GHz quad-core Snapdragon 801 processor, a 4.7-inch 1080p display with a 5.1-inch 117 carat sapphire crystal cover, a 13MP Hasselblad certified camera, a 2.1MP front-facing snapper and 64GB of storage. The Aster also has a 2,275mAh battery and front-facing stereo speakers, but while the specs are certainly respectable, no one buys a Vertu for the specs. What your thousands are really paying for, other than that sapphire screen, is a brushed titanium frame and calf leather back. But that's the pauper's choice really, after all, what's exotic about calf? Any self-respecting man (or woman) about town will want to pay a little more. Perhaps £5,600 (around $9,100/AU$10,300) for snake skin or how does £5,900 (around $9,700/AU$10,900) for ostrich skin sound? It's a positive steal compared to the Ti, which maxes out at £13,900 (around $18,600/AU$18,100). So why is the Vertu Aster cheaper? Well for one thing there's no Black PVD Titanium Red Gold Mixed Metals model, but it also only comes with six months of Vertu's 'Classic Concierge' service rather than a whole year and you don't get a dedicated agent. Perish the thought. Still, if those mansion renovations ran up a bigger bill than you were expecting, it might be worth considering. The Vertu Constellation is another 'affordable' option.